Camel was capable of being the best band in prog, but they’re typically excluded from the King Crimson, Yes, and Genesis short list. The reason I’d suggest they aren’t usually held in as high regard is because Camel never made a truly great album on the level of something like Red, Close to the Edge, or Foxtrot. But Camel also never made a bad album. By 1977, Yes was well past their prime, Genesis was a joke, and King Crimson was broken up- still a few years away from releasing the “Discipline” abomination. 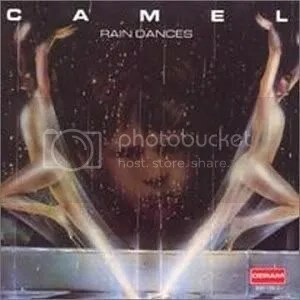 Camel was still going strong and Rain Dances, while starting to move away from the symphonic tradition, was their closest attempt so far at greatness. It seems that a lot of reviewers think this album is where Camel fell off. This was their first album to include bassist Richard Sinclair of Caravan and Hatfield and the North, as well as saxophone lord Mel Collins of King Crimson. Brian Eno also makes an appearance on a song, so expectations must have been quite high. The overall sound is noticeably different from that of previous albums, heading towards a kind of light-fusion on “One of these Days I’ll get an Early Night” and sophisticated pop on “Highways of the Sun”. It’s not that these songs are bad, they just aren’t “classic Camel”. Also present are a couple of the best Camel songs, “First Light” and “Unevensong” being two of the finest examples of the genius they could create and ranking among the best the genre has to offer. The keyboard of Peter Bardens is a particular highlight on both of these songs, and his contributions would be greatly missed when he left the band about a year later. And that’s just what you get with this album, a few incredibly good songs and a few pretty good songs. Not a landmark album to be sure, but maybe the most consistent Camel, and brilliance compared to the general state of late-70’s UK prog.